Bambusa Pro is a simple and utilitarian sans serif typeface created by Hanneke Classen and published by Fontforecast. 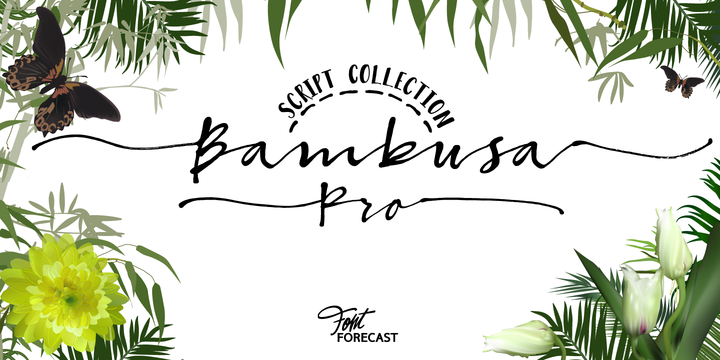 Ready to be used, with a handmade look, Bambusa Pro is a calligraphic font and it has some differences from Salt & Spices Pro. Is available in four styles, all characters connect to each other, connecting words five alternative spaces and also has beginnig & ending swashes. It works great on greeting cards, logo, headline, magazine, packaging, wedding etc. It feels good to be lost in the right direction! Price: all 4 fonts for only $49. A font description published on Friday, January 8th, 2016 in Fontforecast, Fonts, Hanneke Classen by Andrei that has 6,133 views.